A classic F5 Records 45 re-issue from 1993. Hard 2 Obtain, a Long Island hip hop group composed of MCs Taste and DL with support from DJ Six Seven. This release features the single “L.I. 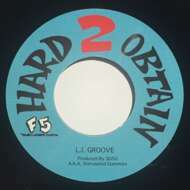 Groove” and “A Lil Sumthing” featuring The Artifacts. Both tracks produced by SD50 aka Stimulated Dummies.